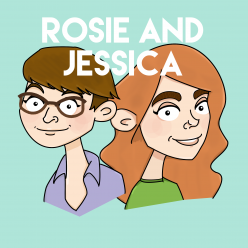 In episode 78, Rosie and Jessica discuss the return of Unbreakable Kimmy Schmidt to Netflix and solve mysteries, one hug at a time. They also discuss the work of Victoria Wood and their love for the sitcom dinnerladies, which leads to lengthy school dinner reminiscence. Plus the return of Fat Squirrel and his Pigeon Friend, Tony! Jessica picked The Ballad of Barry and Freda by Victoria Wood, while Rosie went for Drag by Cat’s Eyes. Elmo's friend @Lin_Manuel won a fancy prize called Pulitzer, but Elmo doesn't know what it means! Congratulations Mr. Lin! Yea baby!